Description: Sexes similar. Reddish-brown above; white below; trace of buff spotting on breast; gray flanks; grayish face; and incomplete and indistinct gray eye ring. 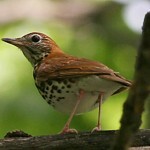 Habitat: Migrants are found in dense and damp bottomland deciduous forests that are close to running water. 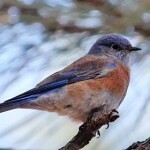 Where in Nebraska: Uncommon spring and fall migrant across the state, probably more common in eastern Nebraska. Field Notes: Veerys are secretive birds, living in dense shade. 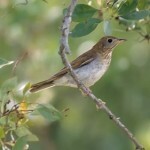 Experiments on other thrushes show that their vision in the dark is better than that of most other birds. 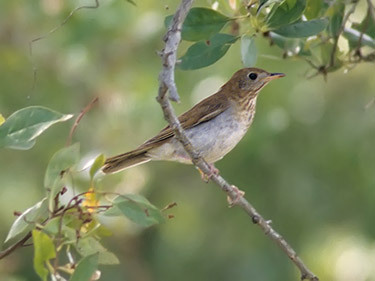 Fun Facts: The Veery, in a recent study, was shown to fly over 160 miles in one night and travel at altitudes above 1.2 miles high.